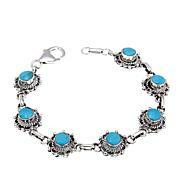 This pretty silver and turquoise line bracelet is proof that not all Southwestern-inspired jewelry has to be big and bold. Handcrafted by Native American silversmiths, its soft blue colors and delicate silver details are easy to dress up or down — making it perfect for anytime accessorizing! 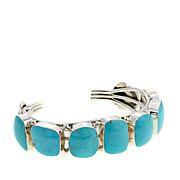 I have been looking for an oval turquoise station bracelet for a while, to match up with an oval turquoise ring I've had for years. This bracelet is so pretty and looks like an expensive high quality piece. I have small wrists so the 7 inch worked perfectly - falls just right, not too loose or too tight over my hand. First Chaco Canyon purchase and I will buy again for sure! It is just what I wanted to stack with my sterling silver chain bracelets ! My wrist is 6 1/2 inches and the 7 inch is perfect ! 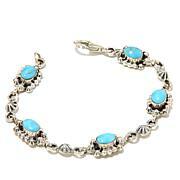 This is a beautiful, feminine bracelet that's easy to wear and goes with anything. 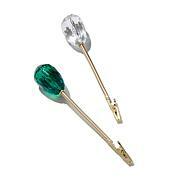 The silver work is finely detailed and the dark oxidation surrounding the stones really makes their color pop. The large lobster claw makes it easy to clasp and is very secure. It's a bit overpriced but for something you can wear every day it's still a good value. This bracelet is nice but not big enough. I ordered the 8 inch bracelet thinking that the bracelet would overall be longer in length, wrong. They are counting the extension chain in the 8 inches. I had to put the clasp on the very last link. The bracelet turns on your wrist so all you see is the extender chain. Would buy again if they would make a true 8 inch.